Epsom College is in a race to become the first team to sail an autonomous boat across the Atlantic. The global challenge, which has been running since 2010, features teams from Universities, Engineering Institutions and the US and French Naval Academies, but Epsom College stands alone as the only school in the world to compete. 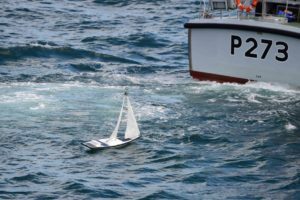 In June, 10 sixth-form pupils will launch their carefully-crafted vessel ‘That’ll Do 2’ from the south coast of England, in the hope that it will complete the treacherous 4,000 mile transatlantic voyage to the east coast of Antigua. Led by Jamie Styles, Epsom’s Head of Chemistry, and Chris Telfer, Head of Physics, The Microtransat Challenge has brought together students from the Mathematics, Geography, Science and Computing Departments, who have been working on the design of their boat since September 2016. The initiative is part of the school’s STEM offering, which allows students to explore aspects of science, technology, engineering and maths outside of the curriculum. The club’s aim is to allow students to gain teamwork and leadership skills while working collaboratively to solve problems big and small. The boat’s complex components include a USB datalogger which will be used by the team back in Epsom to track ‘That’ll Do 2’s’ voyage across the Atlantic. The device, which is self-designed and programmed, weighs just 100 grams and logs latitude, longitude, altitude and temperature data. The boat itself uses a GPS module to calculate its position and to determine a safe passage to the next waypoint. This information is stored in its memory, using software the students have written themselves. The boat also has the ability to transmit its location every hour, from anywhere in the world, directly to its own Twitter feed, via the Iridium satellite network. To date there have been 24 Microtransat attempts, but none has been successful. The best effort so far came from Offshore Sensing, whose 2m boat travelled 68 days before being picked up by a fishing boat. Epsom’s first attempt, in the summer of 2016, received support from the Royal Navy and reached a commendable 374 km in 4 days and 21 hours before being recovered ashore. This year’s team is well aware of the size of the task and their chances of success given that a number of better-funded and resourced universities have already tried and failed. If successful, ‘That’ll Do 2’ should arrive in Antigua approximately six months’ after launch.